This article is about free 'EEG Meditation' app for Windows PC. General questions of EEG meditation and various applications for PC are described in this article. Free 'EEG Meditation' app for Android is described in this article. 'EEG Meditation' app (press this link to download the archive of app, 4.6 MB, 12.04.19, does not require Microsoft .NET Framework, or this one with installer, requires Microsoft .NET Framework 4.6.1) for NeuroSky MindWave (or NeuroSky MindWave Mobile) device helps you in your meditation practice. This app reads electrical activity of the brain with EEG technology of NeuroSky MindWave device. In order to use this application, you need to have NeuroSky MindWave (or NeuroSky MindWave Mobile) headset. App makes a sound signal when the selected by user meditation level threshold is exceeded or not reached, according to your choice. Also you can select a tone or white noise as signal. This sound signal allows you to control your meditation (with closed eyes, or the opened ones), and in 1-2 seconds to know, that you are out of meditation. To use ‘EEG Meditation’ app wear and turn on the headset and press 'Start' button. Stop your internal monologue for meditation. Try to close your eyes for better meditation. For faster progress it is better to choose such a sound level threshold for meditation so that you hear the sound about 1/2 of the time or less. It is better to reduce the sound volume to a barely audible one. After the beginning of the meditation session, you can turn off the screen (by briefly pressing the power button) to save battery and track only the sound. If the quality of the headset signal has often become poor, try wiping 3 metal sensors (for the forehead and 2 on the ear clip) of the headset (and possibly the skin) carefully with a medical nonwoven alcohol disinfection cotton pad for injection. For development of the mind the NeuroSky Mindwave Mobile headset and this app can be compared to collapsible dumbbells for the development of the physical body. If you just look at dumbbells every day, touch them and watch videos on Youtube about how to do best exercises with dumbbells, how others do these exercises and discuss these exercises with friends, there will be no progress. And even if you spend a month or two training every day, you too will not notice much progress. In both cases, at least a few years of training is required to achieve a tangible result. But, unlike a physical body, consciousness has no limitations for its development. The author of this app has crisscrossed half of India for 8 years, published more than 20,000 photos, lived in dozens of ashrams, communicated with several saints & wonder-workers, hundreds of monks, and saw thousands of stray sadhus pretending to be saints and connoisseurs of meditation and samadhi. I participated in hundreds of rituals, pujas, yajnas and other authentic and sometimes highly theatrical performances. The scriptures say that meditation is higher than any rituals and mantras, and that only a continuous practice of meditation can really give a chance for self-realization. This app is a kind of quintessence of meditation practice. It is not one more Cargo cult. The main idea of genuine meditation is to stop internal monologue for a longer period of time. The thoughts are related with beta rhythm (12-30 Hz) of the brain, and meditation starts with prevalence of alpha rhythm (8-12 Hz), and also gamma rhythm to some extent. All these easily can be tracked by NeuroSky MindWave Mobile headset. This app (with help of headset) can track your brain rhythms and starts to make a sound signal after 1-2 seconds of your changed state of meditation (in or out, according to your choice). This sound signal allows you to control your meditation, and in 1-2 seconds to know, that you are out of meditation (or in). This allowes you ‘to make the efforts’ to return to the state of meditation, thereby making your practice more efficient and faster. There is nothing easier for meditation training, than this exercise. With this app you don't need to crisscross India for years, you don't need to spend your time and thousands of dollars on your way to & in India for hundreds of fake saints and sadhus with their constant demands of 'baksheesh'. You will not need to risk picking up an amoeba in India in some salad or drink that will devour your kidneys or liver in 2 weeks, or risking everything in transport on often collapsing Himalayan mountain serpentine roads. You can use this app in your comfortable home in your favorite armchair, and this will be much more efficient for your personal growth and self-realization, than desperate searches through the turmoil in the hope of a sudden 'miraculous' transformation, which some bored saint under banyan tree could do out of the blue for you. Below are the screenshots of the application. The first screen shows the application screen when you first start it. You can see the signal quality icon of the headset, which is familiar from the Brainwave Visualizer application. To start with the application, put on and turn on the headset, and then tap the 'Start' button. Within a few seconds, the previously installed headset will be connected. Then you will see the changing of signal quality pictograph to green "OK". The application will start to give out the every second (there may be slight discrepancies in time) values of the "Meditation" parameter in the "Meditation level" line. The line "Average:" shows the average level of meditation in the current session. Instead of clicking the mouse to start a meditation session, you can also press Enter or “s” on the keyboard. To pause and then continue, you can press space bar or “p”. To end the session, you can press Esc, Backspace or “t”. Information about the application is available by key “?” (“/”) near the right shift. By pressing the “c” key, the application's current screen is recorded in a JPEG image file with the date and time of the making screenshot as the file name in the “screenshots” folder. You can also manage the application through sections of the standard menu bar. The "Meditation Level Threshold" section allows you to select the level of meditation, at reaching which you will hear a sound signal. Novice meditators can choose 60 or 70, while advanced meditators can choose values in the range of 80-90. The speed of studying meditation will be best when you hear a sound signal about half the time of a meditation session. The "Session time:" line shows the total time of your sitting session (it may differ markedly from real time for different reasons), while the "Meditation time:" line is the cumulative time when the meditation value was not less than the threshold you selected. The string "≥90 time:" shows how much time the meditation value was not less than 90 (the cumulative time). The line "≥80 max solid time:" shows the maximum duration of the period in which the meditation value has never dropped below 80, that is, your current maximum duration of sustainable meditation. You can change the settings right during your meditation session. 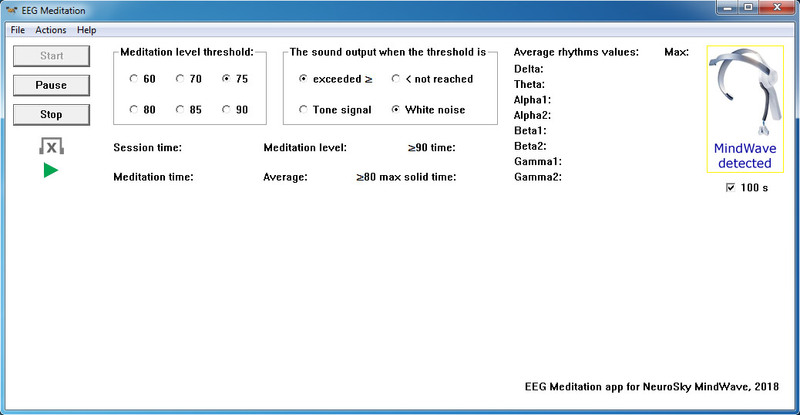 The screen of the "EEG Meditation" application for Windows when you first start it. 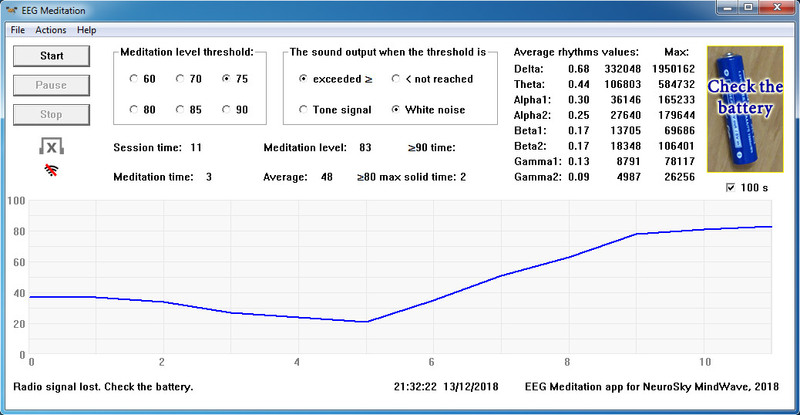 An example of the screen of the "EEG Meditation" application for Windows when a NeuroSky MindWave neuro headset is detected. An example of a meditation graph. 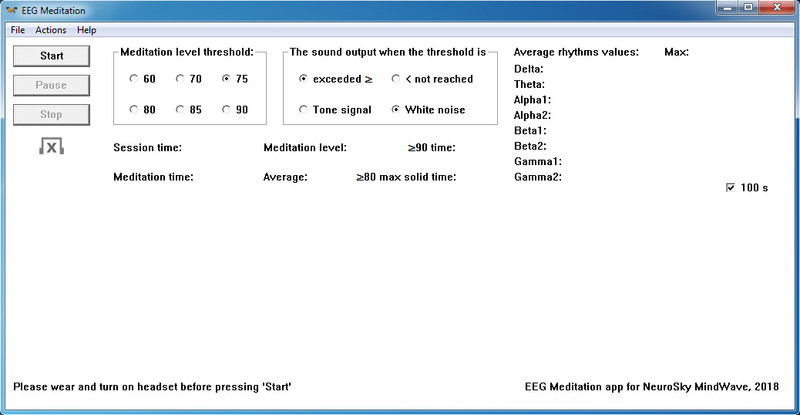 An example of the screen of the "EEG Meditation" application for Windows on pause. An example of the "EEG Meditation" application screen for Windows after stopping the session. An example of the "EEG Meditation" application screen for Windows when a NeuroSky MindWave Mobile neuro headset is detected. The application does not distinguish between the sub-versions of the Mobile Neuro Headsets (basic, "+" or "2"). 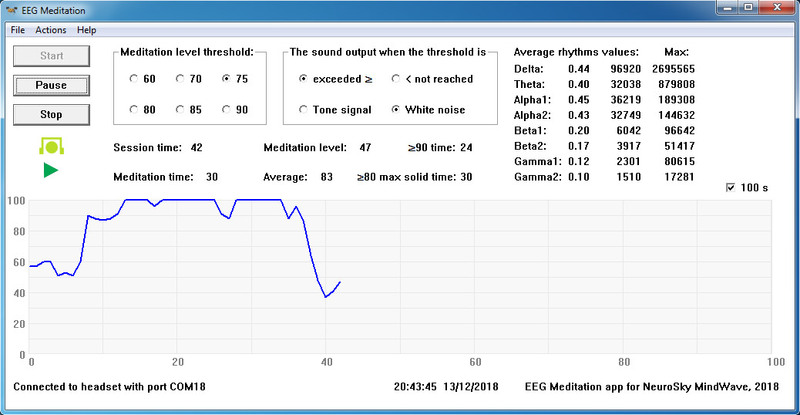 An example of the "EEG Meditation" for Windows application screen when the threshold level of meditation is reached or exceeded. 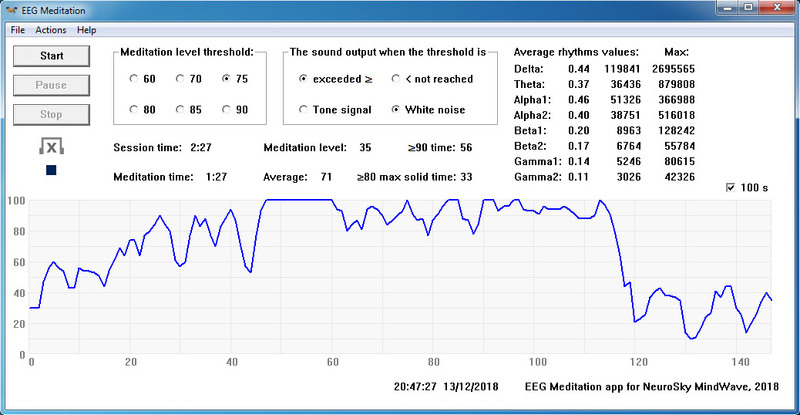 An example of the screen of the "EEG Meditation" application for Windows with the loss of the EEG signal due to fat traces on contacts and skin. 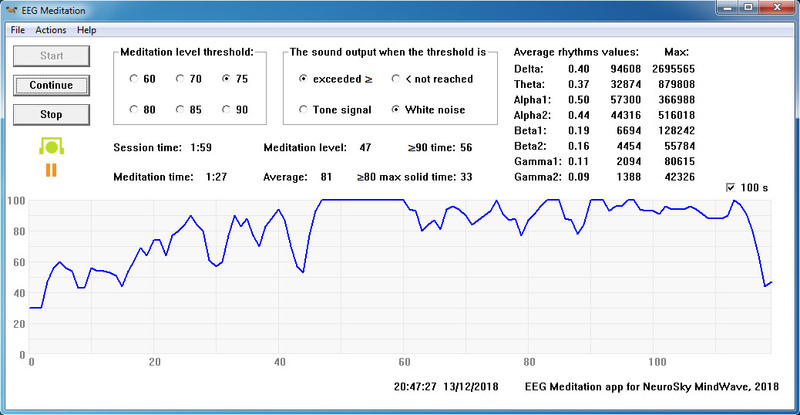 An example of the "EEG Meditation" for Windows application screen with the loss of the radio signal of the headset due to a dead battery or a low level of the radio signal due to an increase in the distance from the headset to a computer or a high level of radio interference. Question: Will those people who have achieved the power to concentrate for hours at a time attain the powers known as the siddhis? In fact, the most important parameters are the value "≥80 max solid time:" and the "Average:" level of meditation. The first parameter is relevant to the above quotation, the second has an indirect relation to it in the case of a high value (≥80) of prolonged meditation (10 minutes or more). Remember that, as elsewhere, progress in meditation will only result from your consistent practice. If the headset's signal is lost due to the discharge of the battery (or rechargeable battery), the poor contact with sensors, the presence of strong radio electronic interference or for other reasons, the application will output a specific short sound signal. The application was successfully tested with the 'NeuroSky MindWave', 'NeuroSky MindWave Mobile', 'NeuroSky MindWave Mobile 2' and 'Sichiray' headsets. It definitely should work with the BrainLink Pro headset also (as well as with any other headset that uses the NeuroSky ThinkGear ASIC module, or TGAM), but author of this application does not have such a headset for testing. If you have BrainLink Pro headset, please try this app and write me (scriptures.ru@gmail.com) if it works with device. The application remembers only 4 user settings for the next start. It does not remember and does not send meditation session data, nor does it send any data beyond your PC. The author of the application experimented with tonal sounds of different frequencies, played depending on the difference between the current level of meditation and the chosen threshold. This cacophony of sounds (the notes) further distracts the meditator and actually reduces the quality of meditation. And its quality is even further reduced by voice prompts, dictating in digits the current average level of meditation in the last few seconds, such as in the application «EEG reader 4 NeuroSky Mindwave». These voice prompts with numbers cause the mind to "digest" the semantic information and, in the process, distract the meditator's mind from meditation, reducing its quality. Perhaps these digital tips are good for the initial period of learning the "technique" of EEG meditation, but they certainly reduce the quality of such meditation in everyday practice. In the course of experiments, it was found that the best solution from the point of view of ensuring the quality of EEG meditation was the use of low volume white noise, which appears whenever you leave the state of meditation (the settings are "not reached" and "White noise" with a low sound volume). This application was written after using the free NeuroExperimenter application by Fred Mellender and using his tips. The rhythms values in the range from 0.00 to 1.00 are relative, and are calculated using the same formula that is used to calculate the rhythms values in the NeuroExperimenter application. Values in the right columns of 4-7 digits are given by the neuroheadset itself. The NeuroExperimenter application has much more functionality. 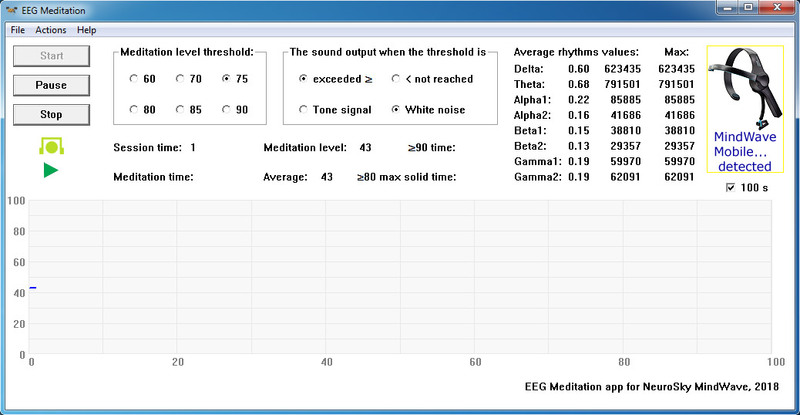 This EEG meditation application is optimized for meditators and differs from the NeuroExperimenter application by the possibility of using White noise (actually Brown noise) as a sound signal (as well as a user sound file), saving user settings regarding sound usage and the "≥80 max solid time:" parameter. You can find the ton.wav and noise.wav sound files in the ‘sounds’ subfolder. You can replace one or both files with your short sound files (preferably no more than a minute to avoid the application hanging, they are played looped) with the same names, and they will sound instead of the existing ones, if you like some other sounds. This application is simple and unpretentious, like collapsible iron dumbbells. Like dumbbells, by itself, lying around, it does not help you. You need your regular practice if you want to achieve a tangible result. Android version of this "EEG Meditation" app for NeuroSky MindWave Mobile black headsets. This is a translation into English of this article of the author of this site. What meditation is and how to meditate.